In this moment of transition, people of good faith across the U.S. are concerned about our country’s future, and about the most vulnerable people among us. In a little over a week we will see the inauguration of a president whose campaign embraced anti-immigrant and anti-Muslim sentiment. He will be backed by a congress seemingly intent on undoing some of the progress we’ve made – including on LGBTQ rights – at the federal level in recent years. This week the Senate began vetting the president-elect’s nominees for cabinet positions. That roster includes many, like Senator Jeff Sessions, Representative Tom Price, and Betsy DeVos, who through voting records and past actions have demonstrated hostility toward LGBTQ people, toward communities of color, and toward some of the most fundamental tenets of equality and security we hold dear. There are reasons to be concerned. 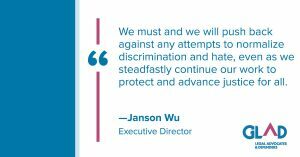 But we must and we will speak out and push back against any attempts to normalize discrimination and hate, even as we steadfastly continue our work in the courts and at the state level to protect and advance justice for all. We aren’t backing down, and I know you aren’t either. The greatest asset we have in this fight is each other. Working shoulder-to-shoulder, talking to, listening to, and showing up for one another is as critical as it’s ever been. I encourage you to make your voice heard on the issues that matter most to you, in Washington and in your community, in the coming days, months and years. There will be much work to do in the coming months and years. It starts with us, together.